Make a mural from Africa. All you need is a large sheet of mural paper about 3 feet by 6 feet and paints or crayons. Click on the small pictures to download the full sized artwork, or click on the link below each picture for the PDF version. Then color, cut out the images and paste to the mural. Print as many copies as you wish. After your mural paper is tacked up, have your class paint a pond for the water plants and grasslands for the background. Use teamwork to make your classroom into the African bush. 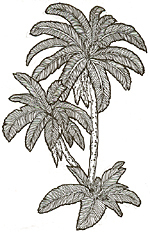 Download sections of African plants and animals to color, then mix and match. If you have a copier with options, reducing, enlarging, and mirroring will give you lots of ways to vary the images. There are several sizes of animals and plants here to chose from too! Hints: To make the perspective of your mural put the smallest animals and plants in front. Draw your own trees with colored markers in the background. The hippopotamus looks comical, but is very territorial and is dangerous. During the day it usually is underwater with only its eyes, ears and nostrils visible. At night it emerges to graze on shore. The two lane trails radiating from African waterholes are nicknamed hippo highways. The honey badger, also called the ratel, is dark brown and black with a fluffy white top side which goes from the top of his head to his tail. Its claws are very powerful and he can break open the tree where wild bees have their nest. His thick coat protects him from the stings. The honey badger is very fierce, and they have been seen holding a lion at bay. The honey guide bird leads people and the honey loving animal, the honey badger, to a wild bee hive. It needs the help of another creature to break open the nest usually built inside a strong tree. The honey guide bird eats the honey and the wax. It's Latin name is indicator indicator. The honey guide is gray brown with a yellow patch on the shoulder of his wing. The male has a black throat. If you want your bird to look exactly like one in the wild, leave slivers of white outlining the small feathers on his upper wing, leave a white eye ring and color his eye reddish brown. His beak is yellow and his legs are gray. This cow elephant is displaying threat behavior by flaring her ears, stamping her feet and trumpeting. Although the bristle like hairs that cover her body won't show in this small drawing, you can see her long eyelashes and hair that covers the ear opening. 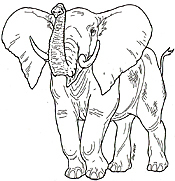 After coloring the cow elephant a warm gray, use a darker gray to cross hatch her hide to show her wrinkles. The elephant is not only the largest land animal, it is one of the most intelligent animals on earth. It lives in complex social groups called troops. The male elephants are called bulls and the females are cows. The babies, known as calves are protected ferociously by their mothers. Color the elephant a warm gray. Their tusks, found on both male and female are yellowy and cream colored. The baby elephant drawing is smaller in size because you would always place it next to its mother. A baby elephant that is small enough to go under its mom is less than a year old. A baby elephant will have hair on its forehead and back. They are darker gray than the adults. This baby's trunk is just dangling, elephants have to learn how to use their trunks. Baby elephants are not born knowing how to grasp with their trunks or spray water with them. Old giraffes, baby giraffes, male giraffes and female giraffes are always interesting to watch. When a giraffe runs, it looks like it is moving in slow motion. Did you know that a giraffe can eat leaves from Acacia bushes that have 3 inch long, ,sharp thorns? They do it with their tough, black, square tongue. 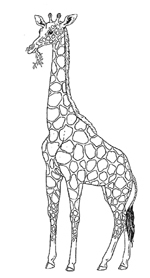 Giraffes look gangly, but they can kill a lion with a hard kick. The ostrich is a flightless bird that lives in Botswana. It is taller than most humans, and is the biggest bird in the world. It's eggs are huge and a person can stand on one they are so strong. The San people who live in southern Africa traditionally use the empty eggs to carry' water through the desert. the white bead in my book are made by them by filing down bits of ostrich egg. An ostrich can outrun predators, or if cornered can rip the attacking animal apart by kicking at it with its huge legs and huge clawed feet. 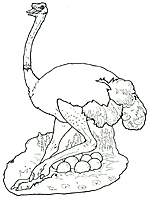 The legs of the ostrich are grayish pink, as well as its bill. Sometime the male ostrich's neck is covered with off white wings and tail. The female is brown with off white wings and tail. Their huge eyes are fringed with long eyelashes. 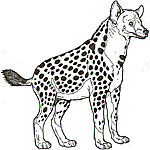 The spotted hyena is tawny brown with a lighter head, belly and feet. Its color helps it blend in the grasslands where it lives. The spotted hyenas hunt grazing animals in their packs, or feed on carrion - animals in that have already been killed by other predators. The hyena is famous for its weird woops and howls. The South African hedgehog is white on his forehead and behind its eyes. His face is a soft light brown and his and prickles, seen from a few feet away are brindled, mixed together reddish brown, grey and cream. Since a hedgehog is a small creature, the size of a guinea pig, put him in the foreground of the mural for the right scale. Normally a hedgehog moves about at night, but perhaps this one is up and about because it was disturbed. When the hedgehog pulls tight the muscle under its prickles it looks like a ball with it face tummy and legs protected. The hoopoe is seen on the ground in the Okavango Delta looking for insects. Color his crest, face, neck, shoulders, and legs reddish brown. His wings and tail are striped black and white. Use your gray to shade the feathers. His bill is light beige. The bat-eared fox lives in savannahs - areas of vast grasslands or deserts. Their huge ears pick up tiny sounds. Insects are what the bat-eared fox eats Color the bat-eared fox a brownish gray, with white where eyebrows would be, and on its chest. The legs are black.. The background color of the zebra is white, but use your gray on its belly to show its roundness and under it's neck. The stripes are black or a deep brown. The zebra lives in large herds where they protect themselves by ganging up on would-be predators. Baby zebras recognize their mothers at about four days old. Each zebra has its own pattern of stripes. 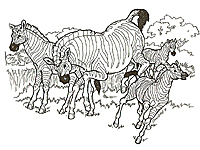 If you are making a mural, stack several "zebra" pages sideways to show a big herd, just like in Africa. My first night on safari I woke up in the middle of the night when I heard a train go by. A train hundreds of miles into a game reserve? No, it was a lion! Male lions look like big kitty cats during the day, tousling each other and caring for their cubs. At night they change into fearsome predators, all muscle. One of the most colorful birds in the Okavango Delta, this bird likes to perch where you can't miss it. It's looking for insects, its favorite food. Its colors are vibrant, and it is so beautiful, Botswana has chosen it for its national bird. There are many kinds of antelope in the Okavango Delta. 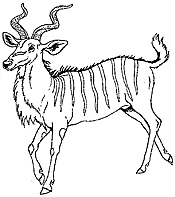 The kudu is an interesting animal to color because it has stripes. The male has spiraling horns. When these animals stand in woody, grassy areas they blend in very well. Mix orange and yellow to color the leopard's coat, leaving the belly, inside of its front legs and neck cream colored. Its chin and muzzle under the nose are lighter still. For extra detail, color the inside of the rosettes a golden brown. The leopard's nose is a dull pink and its eyes yellow-green. Leopards hunt birds, warthogs and monkeys, and antelopes at night. The often drag the carcass up into a tree to keep it from larger predators, like lions. When the warthog runs he puts his tail straight up in the air. Color warthogs gray with paler areas around his eyes and snout. Warthogs live in family groups, and can be seen kneeling as they root for tubers, roots and bulbs or wallowing in mud. The wildebeest is seen in big herds or mixing with zebras and ostriches. 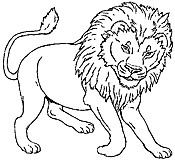 Use blue-gray to color this hoofed animal. His face is black, and his beard off white. The vertical stripes on his neck and sides are a darker blue-gray. Impalas live in herds from six to twenty. Impalas are very plentiful in Botswana, the most common antelope. Color the impala reddish brown. On its midsection that color pales to a lighter shade, and its underside is white. On either side of its tail is a short black stripe, and there is also a black stripe on the top of its tail. 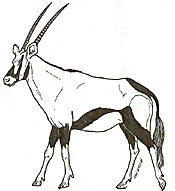 The gemsbok is a large antelope with striking markings. Its head is white with black strips, its belly is white below the hind leg, and its legs are also white. Color his body a sandy gray. This antelope is well adapted to semi desert habitats. 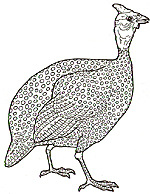 The guinea fowl has a colorful head. The beak and horny top know are yellow, the top of its head is read, as if it has on a cap, and the neck is a vibrant royal blue. Its body is black with white spots. For an interesting project, color the body solid black and use a paper punch to create the white spots. Guinea fowl travel in flocks. Many trees in Africa are covered with thorns and the candle pod acacia is no exception. The seed pods look like candles sticking up. In Tswana, the language spoken in Botswana, this shrub is called, "The House of the Lion" because lions lie in the cool space under its umbrella shape. Candle pod acacia dot the landscape in the Okavango Delta. Use the reduce/Enlarge option of your copier to make different sizes of the candle pod acacia. By putting the large copies in the foreground and the small ones further away you will create the illusion of space. The candle pod acacia is medium green and the pods light beige. What are those weird structures that are seen dotting the Okavango Delta? They're termite mounds. Color them gray, the color of the soil they're made from. If the termites leave the mound, it won't be long before a mongoose family or a warthog will move n, using the hollow spaces beneath as its burrow. The baobab is nicknamed the upside-down tree because in winter, when its leaves have fallen it look like it was stuck in the ground head first. Its bark is smooth with wrinkles, somewhat like an elephant. Its bark is the same color as an elephant, too, a warm gray. 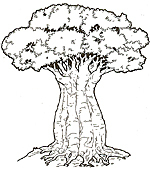 Baobabs grow to be huge in size. Some 400 year old trees would take four men to encircle their massive trunks. During drought the trunk thins down, and after plentiful rains it swells. The wild cucumber blossom is pure white, shading to yellow toward the green center portion. the stamens (very center) are yellow-orange. 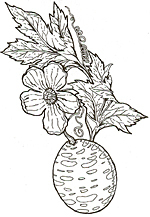 Have fun coloring the hard fruit green, with yellow spots. Color the wild date palm brown with green fronds, the old fronds hanging down from the center are orangey brown. The flame lily is a standout in the lush green vegetation. The petals are yellow near the center of the flower, then shade to orange, and then bright red. The golden bristle grass on the side is green, with golden yellow seed heads. The Water Lily has violet blue blossoms with orange centers. Two large petal-like structures are pale green. The bud is light green with maroon mottling. The lily pad is green with a brick red edge. Place the lilies on a pond of your own creation, a perfect habitat for crocs and hippos.